Don Draper and his Mad Men will soon be streaming to computer and home theater screens everywhere. Netflix has been granted the streaming rights to all seven seasons of 'Mad Men'. According to The Wall Street Journal , Netflix and Lions Gate Entertainment Corp. struck a deal on Tuesday. The deal is worth between $75 and $100 million, according to unnamed Journal sources "close to the situation." That means Netflix is paying close to $1 million per episode (there are seven seasons, each with 13 episodes, for a total of 91 episodes). No word on whether this deal is for the exclusive streaming rights. 'Mad Men' will reportedly drop to Netflix users in blocks--the first four seasons will be available in mid-July, and the fifth, sixth, and final seasons will be available once they're done streaming on AMC (to which Lions Gate is currently licensing the show). 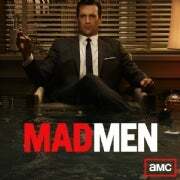 'Mad Men' is about Don Draper, the creative director at an advertising firm in the 1960's. The Wall Street Journal also reports that Netflix is "in discussions" with Comcast's NBCUniversal for nonexclusive streaming rights to NBCU content. NBCU heads several channels, including Bravo, SyFy, G4, E!, and USA. This isn't the first step toward a push for new content by Netflix--earlier this year, Netflix acquired the original TV series 'House of Cards.' Still, it's an important step for Netflix to take if it wants to keep ahead in the race against on-demand streaming services such as Hulu Plus.